The Lewek Emerald is a premium anchor handling tug & supply vessel built in 2003 for worldwide operations to service and tow drilling units and provide logistics support for oil & gas production platforms. With a 410 m2 deck area, she has a bollard pull of 150 tons and 300 tons anchor handling capacity. The Lewek Emerald can accommodate a crew of 33. 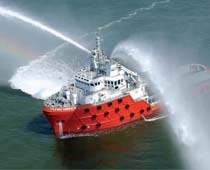 It is equipped with a DP 2 dynamic positioning system and special equipment for fire-fighting, safety standby operations, emergency evacuations and seismic services.